MWC 2019 is a fair of firsts with foldable phones being unveiled, and now a first smartwatch with a bendable screen is on display. This one-of-a-kind wearable form ZTE's Nubia comes with an OLED flexible display, a camera, and eSIM support. The Nubia Alpha wearable claims to come with most features seen on an Android phone. Specifications include a Snapdragon Wear 2100 SoC, 1GB RAM, and 8GB of internal storage. The Nubia Alpha runs on a custom OS, and packs a 500mAh battery. The Nubia Alpha is a smartwatch that sports a 4-inch (960x192 pixels) flexible OLED display. The company claims that this watch has 230 percent more screen real estate than the standard smartwatches out there. It's straps on like a bracelet, and lets users make and receive calls, take photos, and use apps. It also integrates the usual gamut of smartwatch sensors including the heart rate sensor. The wearable is on display at MWC 2019, and will be up for sale starting April. The Nubia Alpha runs on a custom OS that helps in motion gestures. This helps in controlling the smartwatch by just doing gestures in the air, close to the device. 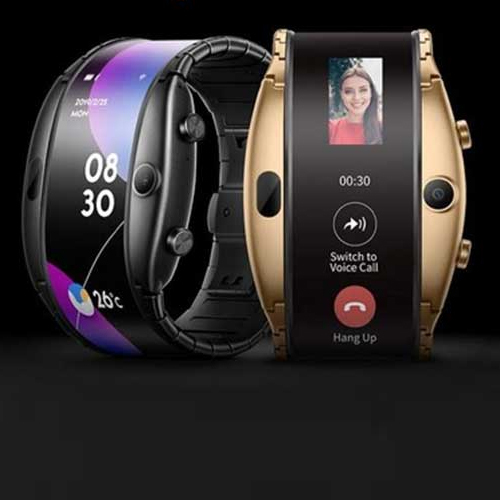 The device has two knobs on the right edge for helping in navigation, supports 4G connectivity via eSIM, and has a stainless steel band in Gold and Black colour options.